This month, aid groups and non-governmental organizations such as the Peace Corps, USAID and Malaria No More asked their volunteers and employees to blog about malaria in observance of World Malaria Day. Many chose to write about their own personal experiences being infected with malaria, or watching someone else who was. Their posts provide a fascinating — and sometimes horrific — look at the disease that kills about 600,000 people each year, most of them young children in Africa. Below are some excerpts from malaria-related blogs posted on the Internet this week. She told me that (four-year-old Tinho) was in the hospital with malaria and that she was afraid he wasn’t going to make it. The next week was filled with anxiety-laden nights worrying whether he was going to pull through. My days were spent going through the motions, but always with a knot in my stomach fearing that I would return home to bad news. But then one evening I was sitting on my porch reading and his mother walked up carrying Tinho. He had just left the hospital and was thin and frail. He looked so much smaller than I remembered him- but he was alive! In my experience malaria starts with a headache which rapidly gets worse. Then as your fever goes up you start to be aware of your bones in a way that you normally do not experience. They ache. You alternate from freezing cold to hot as your body shakes. Even with treatment it can take weeks for you to start getting your energy back. — Family of Cory, Kris, Eli and Anna, Global Partners Missionaries, “Did you think about malaria today? When I remember (my daughter) Melody, I shed tears of bitterness wondering where we failed her. I soliloquize, imagining I should have ignored the ignorant doctor and crushed bitter chloroquin and administered it. But she is long gone and we are focusing on the disease today. I spent two years learning Wolof, getting to know the 300 people who chose to share their village with me, and found out more and more about malaria and the role it plays in the lives of the Senegalese people. Together, the community taught me what it was, what the members valued, what they wanted from their lives and from each other. They taught me how they saw malaria, what they thought of this threat to their lives, what they knew to do when they got sick. They helped me understand why they couldn’t pay the $4 to buy a mosquito net, even though they knew that sleeping underneath one every night would protect them from being bitten by the mosquitos that spread malaria. They talked about being too scared to go to the health post to seek treatment for a suspected case of malaria when their infant sons and daughters became ill, even though they knew the disease was so dangerous. They surprised me with their knowledge and resources, and saddened me with their matter-of-fact statements about their perceptions of the limitations on their lives. It’s not all bad news when it comes to malaria. The World Health Organization reported today – World Malaria Day — that childhood mortality rates from malaria have dropped significantly in some areas, including a 50 percent decrease in Rwanda and 40 percent decline in Senegal. Morocco was recently declared malaria-free by WHO, and the organization predicts malaria deaths worldwide could drop by 3 million in the next five years. A concerted effort by worldwide governments, international donors and groups such as WHO, the International Federation of the Red Cross and USAID has brought more education, treatment and prevention to programs to the countries hardest hit by the disease. International funding for malaria reached $2 billion last year. AFRICOM’s medical command has made malaria prevention and awareness one of its top priorities. The command surgeon’s office, the AFRICOM Medical Division, and the Humanitarian Health and Assistance Branch all support programs to prevent malaria in Africa. Those programs focus on outreach, information sharing and training opportunities with our African partners. – In March, Civil Affairs Team (CAT) 4905, assigned to Combined Joint Task Force – Horn of Africa, distributed 18,000 packs of insecticide-treated bed nets, rope and nails to Ethiopians. – In July, the annual MEDFLAG exercise in Ghana featured malaria as part of the medical training between U.S. personnel and their Ghanian counterparts. – The World Malaria Day Symposium 2011 brought military medical corps officers and subject matter experts to AFRICOM headquarters in Germany for a three-day conference to discuss malaria prevention and how the disease affects the military, security and stability in African nations. Attendees included representatives from Benin, Ghana, Kenya, Liberia, Senegal, Tanzania, and Uganda. – A two-week course in Tanzania in January 2010 focused on malaria diagnosis. The course was a partnership among Tanzania, Kenya and the United States. 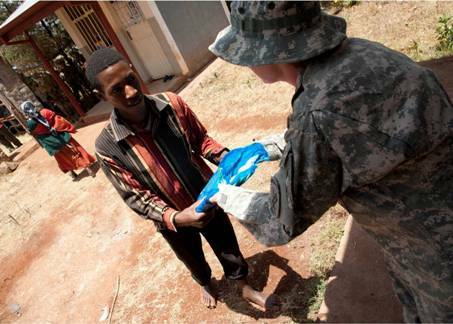 Click here to read more about AFRICOM’s anti-malaria efforts. Also be sure to watch for updates this week about AFRICOM and malaria on our home page at www.africom.mil, on Facebook and on Twitter. Somewhere in the world, a child dies every minute from malaria, according to the World Health Organization. Each year, April 25 marks World Malaria Day. Starting in 2007, the World Health Assembly has set aside an annual day to highlight the international efforts to prevent and limit the damage of malaria. U.S. Africa Command will be marking the occasion with an educational exhibit outside Kelley Theater on Kelley Barracks in Stuttgart from 10 a.m. to 3 p.m. While those in America find mosquitoes merely annoying summer pests, mosquito-borne malaria remains a serious issue in many parts of the world. About half of the world’s population lives where there is a risk of malaria. No one knows exactly how many people contract malaria every year, but the estimate for 2010 was 216 million cases. About 665,000 people died in 2010, according to WHO. The culprit behind malaria is Plasmodium, a parasite that enters the human body through a bite from an infected mosquito. From there, the parasite can multiply in the liver, infect red blood cells, and eventually lead to the blood supply being cut off to critical organs. Symptoms such as fever, headache, chills, and vomiting can usually appear about a week or two after the bite. If left untreated, malaria can lead to death. In Africa, some local adults have developed immunity to malaria. Children, foreigners, and other high-risk individuals remain in potential danger from malaria-borne mosquitoes. The U.S. Africa Command, with some 2,000 people and many more component members, regularly sends U.S. representatives down to Africa for exercises, operations, and humanitarian assistance. Those traveling to Africa from the AFRICOM headquarters in Germany must go through certain precautions to protect against malaria. AFRICOM also hosts malaria outreach programs to help educate Africans about the benefits of mosquito nets, which can help reduce the number of malaria cases significantly. 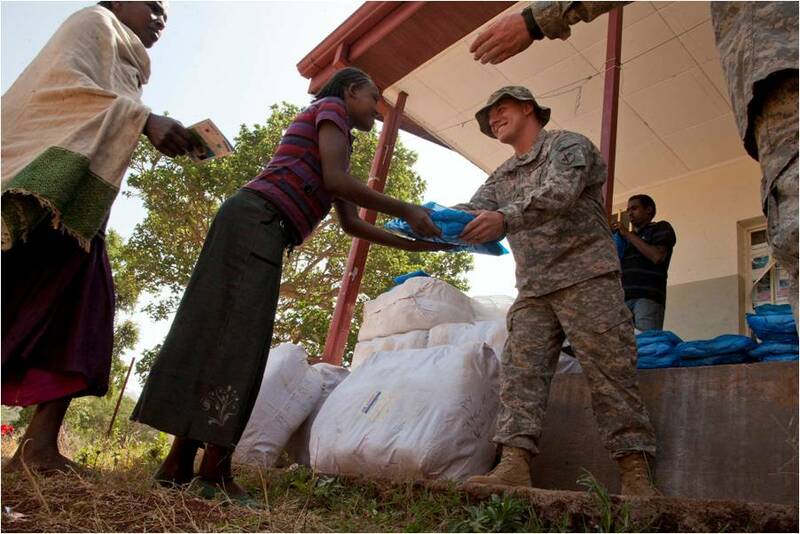 For example, the Civil Affairs Team (CAT) 4905, assigned to Combined Joint Task Force – Horn of Africa, distributed 18,000 packs of insecticide-treated bed nets, rope and nails to Ethiopians in March 2012. Look for more on malaria all week from our website, Facebook, and Twitter. In early April Deputy Assistance Secretary of Defense for Africa Ambassador Vicki Huddleston, visited senior members of government and the Botswana Defence Force (BDF) as part of her first visit to Botswana. Ambassador Huddleston, the senior most Department of Defense official to visit Botswana in the past few years, used this opportunity to pay a courtesy call to the Minister of Defence, Justice and Security, Ambassador Seretse at his office in Gaborone. The meeting, also attended by Ambassador Stephen Nolan, the U.S. ambassador to Botswana, was very productive as both Minister Seretse and Ambassador Huddleston discussed common areas of interest and potential areas of future cooperation. After her meeting at the Ministry of Defence, Justice and Security, Ambassador Huddleston visited Lt Gen Masire, Chief of the Botswana Defence Force at Sir Seretse Khama Barracks in Gaborone. General Masire, who will retire in July, thanked Ambassador Huddleston for the U.S. military’s long friendship and assistance in the development of the Botswana Defence Force since its founding in 1977. Ambassador Huddleston’s next stop was the new Defence Command and Staff College (DCSC) in Gaborone. She met the Commandant, Brigadier General Goitseleene Morake, and his staff. At Brigadier Morake’s invitation Ambassador Huddleston served as a guest lecturer for the current class of 34 students. Her topic was “U.S. Defense Policy in Africa.” The lecture was originally scheduled for 30 minutes but drew so much interest and so many questions from the BDF students that it lasted nearly an hour. In her lecture Ambassador Huddleston highlighted U.S. defense interests in Africa, including transnational threats like terrorism, illicit trafficking and climate change, regional and ethnic issues and diseases like HIV/AIDS, malaria and diarrheal infections that undermine security and stability of states and entire regions. The staff college, now in its third academic year, has quickly become a premier military institution and one of the finest staff colleges in Africa. Temporarily housed at a leased former primary school, the DCSC will move to a purpose built facility at Glen Valley (15 kilometers north of Gaborone) in 2012. At Glen Valley the DCSC will train not only Botswana officers but will also begin taking foreign student officers from throughout Africa. The BDF Air Arm then flew Ambassador Huddleston and her party from Gaborone to Kasane in the far northeast by C-130 transport aircraft. Heavy rainfall over Gaborone had resulted in a gray, overcast day throughout the first day of her visit. As the crew flew north they left the clouds behind, offering Ambassador Huddleston and her party an aerial view of Botswana’s second diamond mine at Orapa and, further north, the now water filled Makadikadi Pans which are normally dry basins. The flight arrived in Kasane shortly before sunset with clear skies. On the final day of her visit Ambassador Huddleston and party drove to the Chobe Sub Sector headquarters near Kasane, where the Major Israel Mbangwe, 15 Infantry Battalion, Botswana Defence Force gave the visitors an operations brief detailing BDF anti-poaching operations and support to civil authorities in the region. The briefing was followed by a site visit at a BDF base camp in the bush. BDF soldiers use the base to patrol for poachers and protect Botswana’s diverse wildlife from predation. Tourism is the second largest contributor to Botswana’s economy. Conservation is also a significant area of interest for the government. The BDF does its part to protect Botswana’s natural endowments. In Botswana, the protection of wildlife and the environment are considered to be in the interest of national security. The final event hosted by the BDF was a boat trip up the Chobe River with a BDF Engineer Detachment based at Kasane. Members of the Kasane based Engineer Detachment transported Ambassador Huddleston and her party along the Chobe River where she was able to she first hand the variety and abundance of BDF protected wildlife along the banks of the Chobe. This included sightings of elephants, hippos, impalas and the rare puku antelope. 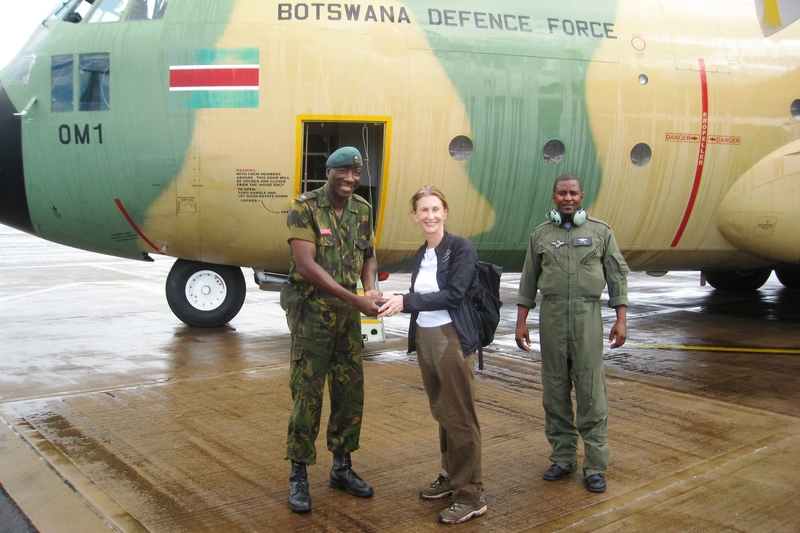 On her return to Gaborone with the BDF Air Arm, Ambassador Huddleston remarked at “as a military, how professional and experienced the BDF is.” She returned to Washington having been very impressed with not only the BDF, but the people and the country of Botswana as well. In her current position as a Department of Defense senior official and her past experience within the State Department, Ambassador Huddleston is a unique person in Washington. For their part, the BDF hopes the trip will prove useful to the long established relationship between the BDF and the U.S. Department of Defense.